[prMac.com] Perth, Australia - Pixelglow Software today announced Instavue, a new Mac OS X application. Instavue is a companion application to Instaviz, the graph sketching app for the iPhone. 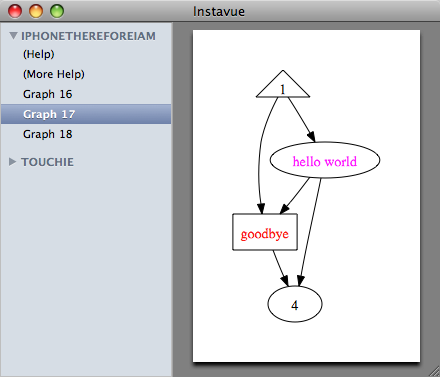 Instavue enables Instaviz users to print and export graphs from their Mac OS X desktop. Instavue extracts the Instaviz graphs from the user's iPhone or iPod Touch backups. The user can then choose to print the graphs or export them to any of these vector and bitmap formats: BMP, GIF, Graphviz, JPEG, JPEG2000, OpenEXR, Photoshop, PDF, PNG, PostScript, Quickdraw, Silicon Graphics, SVG, TGA or TIFF. Instaviz is an iPhone/iPod Touch app that turns roughly sketched shapes and lines into beautifully laid-out graphs. The app is great for drawing mind maps, concept maps, flowcharts and graph theory, or just simple note-taking and brainstorming. Despite being in the App Store for little over a month, Instaviz has already garnered 8 five-star reviews there. 148apps, the popular App Store review site, recently rated Instaviz 4 out of 5 stars. Mac OS X 10.5 (Leopard) and iTunes 8.0 or better. Instavue may be downloaded and installed for free. For further details about this release, please visit the Instavue website. Pixelglow Software synthesizes disparate ideas into simple and intuitive working software solutions. On the Macintosh, Windows and web platforms for over 12 years, they work with clients ranging from small firms to multinationals like WorleyParsons, AT&T and Autodesk. Their Altivec-optimized SIMD toolkit macstl is well-regarded in numerics and high performance computing circles since 2003. Their port of Graphviz to Mac OS X took two prizes in the Apple Design Awards 2004: Winner for Best Open Source Product and Runner-Up for Best New Product. Copyright 2008 Pixelglow Software. All Rights Reserved. Apple, the Apple logo, iPhone and iPod are registered trademarks of Apple Computer in the U.S. and/or other countries.